Phase one of the Thornton Bank offshore wind farm is installed with six wind turbines, each rated at 5MW. Image courtesy of REpower Systems. The wind turbines were designed, supplied, transported and installed by REpower. The company was also contracted for the second and third phases. Image courtesy of REpower Systems. Thornton Bank offshore wind farm features 54 wind turbines, with a total installed capacity of 325MW. Image courtesy of REpower Systems. The wind farm is located 30km off from the Belgian cost in water depths ranging from 12m to 27.5m. Image courtesy of REpower Systems. Construction on phase one of the project commenced in May 2007. It was connected to the power grid in late 2008. Image courtesy of REpower Systems. Thornton Bank, Belgium’s first offshore wind farm, is located in the North Sea, about 30km off of the Belgian coast. It is also the largest offshore wind farm in Europe. The project was developed in three phases, with a total installed capacity of 325MW. The total development cost reached about €1.3bn. The first phase has been in commercial operation since June 2009. In the first six months of operation, it was operated at a utilisation rate of 94%. This increased to 97% in the next six months from January to June 2010. In July 2012, installation of 30 turbines as part of the second phase of the wind farm was completed. The wind farm had a total output of 215MW at that time. Work on the third phase of the project was started in 2012. The wind farm was fully commissioned in September 2013 with total installed capacity of 325MW.The wind farm is expected to generate about 1,000GWh of electricity, sufficient to meet the requirements of about 600,000 Belgian households. Compared to a modern gas-fired power plant, the wind farm will offset about 450,000t of carbon dioxide emissions each year. Electricity generated by the first phase is being sold to Eneco (Belgium), a Dutch company specialised in the production, trading, transmission and supply of gas, electricity and heat, as well as other related services. Eneco also purchases half of all the power produced by the second phase of the wind farm. Belgium’s first offshore wind farm was also the largest project-financed one in Europe. The project reached financial closure in November 2010. A total of seven commercial banks, together with the European Investment Bank (EIB), Eksport Kredit Fonden (Danish export credit agency) and Euler Hermes (German credit export agency) provided long term facilities, totalling €900m. The seven commercial banks, all from Europe, included Societe Generale, KBC, Rabobank, Commerzbank, Dexia and ASN Bank. "In July 2012, installation of 30 turbines as part of the second phase of the wind farm was completed." Thornton Bank offshore wind farm is installed with 54 REpower wind energy turbines. Phase one, with a total power production capacity of 30MW, was installed with six REpower 5M type wind turbines, each rated at five megawatts. A total of 30 turbines with a capacity of 6.15MW each were installed in the second phase by RE Power Systems. 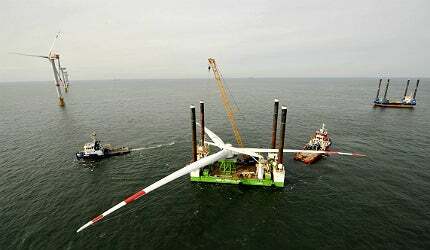 The third phase witnessed the installation of another 18 turbines. The wind farm is located 26km from the shore in water depths ranging from 12m to 27.5m. The first phase, which was a pilot project, was built across an area of one square kilometre. The second phase was developed over an area of ten square kilometres and the third phase covers around 12 square kilometres. The generated electricity is transmitted ashore to the feed-in station in Sas Slijkens, via two three-phase 150kV submarine cables. The necessary environmental permit and domain concession for the wind farm was obtained in 2003. The required building permits for ashore and far shore cabling works were subsequently received between 2003 and 2006. "A total of 30 turbines with a capacity of 6.15MW each were installed in the second phase by RE Power Systems." The project was developed in two sub-areas, designated as sub-area A and sub-area B. The developers opted for split location so as not to interfere with the navy’s anti-mine and target practice areas. This also ensured the project site maintained a minimum distance of 0.5km from nearby gas pipelines and telecoms cables. Located to the west of the Concerto South 1 telecoms cable, sub-area A features 24 wind turbines. Sub-area B, located to the east of the Interconnector Gas Pipeline, is installed with 30 wind turbines. Construction on phase one of the project commenced in May 2007. All the wind turbines were installed in 2008 and were connected to the power grid in the last quarter of that year. The last wind turbine was started up in May 2009. Construction on the second phase commenced in 2011. The 30 wind turbines for this phase were installed by July 2012. The turbine installation for the third phase was completed by June 2013. All the turbines were installed on concrete gravity base foundations. The project was developed by C-Power, which is owned by a number of shareholders. RWE Innogy, with a 26.73% stake in the project, is the largest shareholder. Other shareholders include DEME (Belgian dredging and hydraulic engineering group), Societe Regionale d’Investissement de Wallonie (SRIW), Ecotech Finance (the environmental holding company of Walloon Investment Company), SOCOFE (the investment company of the public administrations of the Walloon Region), NUHMA (Investment vehicle for the participation in electricity and utility ventures) and EDF Energies Nouvelles (a 50%-owned subsidiary of the EDF group). C-Power adopted a multicontract strategy for the delivery of the first phase. The first contract was awarded to the Seawind consortium, comprising of Dredging Marine and Electrical Infrastructure Works (MEC). REpower was contracted to design, supply, transport and install the wind turbines. It also supplied 48 wind turbines for the second and third phases. ABB was contracted for the supply and connection of the marine export and in-field power cables. ABB was further awarded a $125m contract for the second and third phases. Jacket foundations at the wind farm were installed by OWEC Tower. Technum and IMDC, from Belgium, and DONG Energy from Denmark were the owner’s engineers. COWI was sub-contracted by Dredging International to provide detailed design of the gravity base foundations. Mott MacDonald was the lender’s engineer. The Princess Amalia Offshore Wind Farm is located on the Dutch Continental Shelf at block Q7 in the Netherlands. Nordsee Ost offshore wind farm is a 295MW renewable power project being built approximately 19 miles north-east of Helgoland, a German archipelago found in the North Sea. DanTysk offshore wind farm is a 288MW power project to be located in the North Sea, at about 70km west of the island of Sylt in northern Germany.